1 JUNE 2016—Owings Mills, MD—Air Techniques International (ATI) announced the release of its latest innovative product, the ATI Real-Time Biodetection Sensor. The announcement was made concurrently in Washington, DC at the NCT: CBRNe USA Conference and in Tokyo, Japan at the CBRNE Convergence Asia Conference. 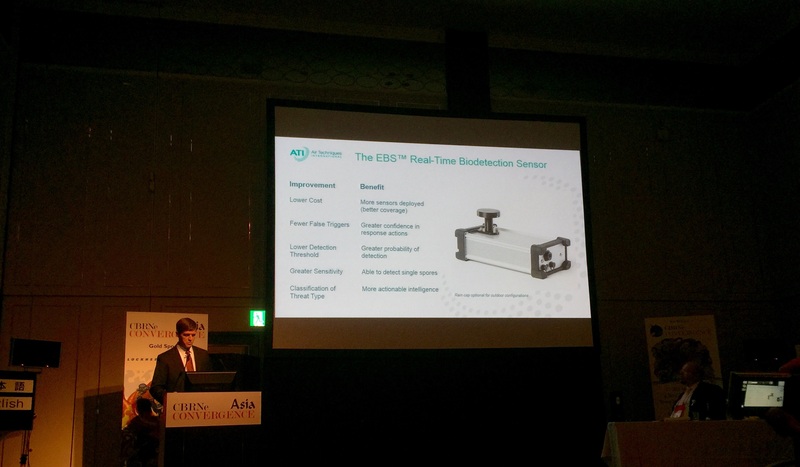 ATI President Ron Adkins presented in Tokyo, while the Director of Sales, Jon Beville, presented in Washington, DC. The presentations focused on the changing nature of the threat posed by a biological attack, the lack of preparedness among so-called “soft targets” such as airports and mass transit systems globally, and the evolution of biosurveillance system architecture and incident response. In December 2015, ATI acquired the underlying technology in from S3I, a defense technology development company led by David Silcott. The companies have been working collaboratively to develop the sensor technology into a deployable platform. Silcott is widely recognized as one of the world’s foremost experts in biosurveillance, and as the developer of the IBAC™, a previous generation of biological aerosol sensor that has been successfully deployed in a range of biosurveillance applications. Air Techniques will continue to display and highlight the sensor technology through presentations and demonstrations at events in the second half of 2016, including ASIS National Convention in Orlando September 12-15 and CBRNe Convergence San Diego October 31-November 1.